With the Olympics coming to a close, it was really emphasized to me this year the immense amount of cooperation and collaboration that goes into creating a medal-winning athlete. Although we only see the top shining stars out on the slopes, ice rink and luge runs, in reality what got them there has included a gigantic amount of people. Trainers. Nutritionists. Sports therapists. Coaches. Assistant coaches. Weight trainers. The list goes on and on…all the way to the screaming fan, jumping up and down in glee, just happy to see their favorite athlete taking the chance at winning. It is such an impressive showmanship of the immense power and positivity that comes out of working together in an encouraging way. Inspirational really. And that is what positive collaboration is all about…working together in a fun atmosphere to create greatness. So, thank you to the Olympics of 2010 for setting the stage for another games that has brought tears of joy, laughter and smiles. It’s been great watching from the sidelines. 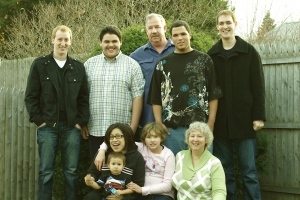 The first time I read her blog “Raising 5 Kids With Disabilities” I was inspired. Not only because she is helping children in need, as that is one of my lifelong passions. Not only because she so eloquently let’s us into her life via her blog. But also because she is a living example of positive collaboration. Lindsey Peterson is the mom of five bright and beautiful children. The only slight difference is they all have disabilities. Her family, which includes both adopted and not, is one of love. It is a chosen path of helping others have a better life…with a few moments of frustration, sibling rivalry and temper tantrums thrown in. EH: Had you always wanted a large family? LP: I never really thought about having a large family. I only knew that it felt good to help people. My whole life I’d volunteered at various places to be with people. I have been volunteering with a recreational group of adults with disabilities for more than 35 years. They are wonderful friends and THEY inspire me to be a better person. Adding to our own family became a natural extension of that. If I could have that happiness on the twice a week this group met, why not have it every day in my life? It was FUN to raise kids. Plus, I am not the best housekeeper, so my rationalization was that if I have 5 kids to take care of, washing the floor does not have a priority. I’d much rather take care of kids than clean!! EH: What inspired you to adopt initially? LP: When I was pregnant, I desperately wanted a daughter because my mother and I had such a great relationship. I had a difficult labor, (I had actually fallen down the stairs before the birth and bent my tailbone in, so the only way the baby could come out was by bending it back out again, and that took FOREVER!) When my son was born, bless him, I was SO disappointed. The very day he was born I decided to adopt because that would be the only way I could guarantee a daughter. My husband, of course, didn’t agree so readily and attributed my decision to adopt based on the long labor I had just been through! Then, as it turned out, my son had hereditary blindness. Problem solved. Because it was hereditary, my husband did not want to risk having another biological child, so he agreed to adoption. We chose Guatemala because the adoption agency we chose sponsored an orphanage there so we knew the children were well cared for. Our son Francis was 2 when we adopted our daughter, Dinora. We have the CUTEST picture of her sitting in the infant seat and Francis holding her head in one hand so he could find her mouth to feed her bottle with the other hand. He loved her as though she were a fuzzy pet. EH: What was the initial reaction of your birth children when they learned that you would be adopting? LP: Francis was glad to have Dinora initially, although as she grew she became the aggressive one and would jump on him and tackle him from an early age. Fortunately she was pretty loud and had heavy footsteps, so he could hear her coming and get out of the way. After a few years with Dinora, we decided we wanted more children, but could not afford another international adoption, (which can be VERY expensive.) I knew a friend who did foster care and was able to adopt the first baby she fostered. GREAT, I thought, you could have a child for FREE! Little did I know, but soon learned, was that most foster children do not end up being adopted by their foster families. We ended up having 14 foster babies before we were able to adopt Steven. We were all careful not to get toooooooo attached to the babies because chances were they would go to live with a family member or, heaven forbid in some cases, be returned to their birth parents. I had to look at it like we were doing a good thing and giving these babies a head start in life but I prevented myself from getting attached. Besides, I LOVED babies, and I’d much rather play with a baby than wash the floor. We did only take male babies because Dinora herself expressed extreme jealousy if we were to consider a girl. By the time Steven was adopted, he had already lived with us for 3 years and the permanent transition was easy. Then we had another foster boy we planned to adopt. We had him from birth to age 3. His grandmother had tried to get custody, but because she was 76 years old they had denied it. We were in the middle of the adoption process when the court reversed their decision and decided to let the grandmother adopt him. She turned out to be a lovely woman and we invited the her, (from Puerto Rico) to come and stay with us during the adoption process to ease the transition. We still have contact with them and he visits with us every summer. However, because we had thought he was going to be our son, we had become attached, and his leaving was the most devastating thing that ever happened to our family. Although I wanted more children, we didn’t want to go the normal foster care route. So, we took in a 3 year old who had been in 5 foster homes and was currently in a nursing home for children with AIDS. He had been born HIV positive, but, as happens frequently, his mother’s HIV antibodies left his system and he became HIV negative. Because of his HIV status and the fact he had been in foster care for 3 years, AND the fact that his birth mother had 6 other children removed from her and they were living in foster homes because there was no family to claim them, they could pretty much guarantee we would be able to adopt him if we took him in as a foster child, and we ended up doing this.His name was Angel. My other children accepted Angel automatically, (they were used to babies in the house anyway.) The funny thing was, Angel did NOT, (nor has he EVER,) accepted THEM! He has always been intensely jealous and he often tells me he wishes he were our only child! We thought we were done adopting, but then a call came in requesting we take in a 7 year old girl who was profoundly deaf. (They called because I know American Sign Language.) It was supposed to be on a temporary basis, but when she was 10 we ended up adopting her. Dinora was, and still is, resentful because she wants to be the only daughter. She was in college at the time, and my feeling was she wasn’t even living with us, but she has never accepted Marie fully. Angel and Steven hated her, as only brothers can hate their little sisters. EH: How is their acceptance today with their adopted brothers and sisters? LP: Francis loves them all. He was the first child and had his special time as an only child, plus he is now 27 and does not live at home. He especially enjoys using American Sign Language with Marie. The other children have a tolerance for one another but are not especially close. The whole family has learned sign language and we use it regularly at meals and any time we talk. Well, MOST of us use it all the time. Angel take special delight in talking without signing on purpose so Marie does not know what he is talking about! EH: What is your biggest challenge in raising children with special needs? Honestly, my biggest challenge was in learning not to care what other people think. I have always been that way to some extent, but when you have a child with Asperger’s syndrome having a meltdown on an airplane for 2 hours, it would be enough to make most parents crazy. (Even my husband went to hide in the back of the plane.) We have had the ambulance at our house many times and my children have had to be restrained many times, especially may daughter Marie who has serious Post Traumatic Stress Disorder due to early childhood abuse. She has a history of flipping out and hitting, spitting, biting and so forth. (She reminds me of when Helen Keller was under the table when the family was first eating.) She looks like a wild animal, glaring eyes, messy hair, no concept of what is going on around her. It has been a learning process, but I have learned to calm myself during their most dramatic episodes. Now I am so calm I make sure I bring my “hospital purse” with me that has a bottle of diet coke and a large print book to read for those long emergency room visits! EH: Where do you find the most support? LP: Support…support…what’s that? My basic support is spiritual. Just me and God. Calming. I do not generally share my problems with others, so most of my friends and work acquaintances do not know the extent of their problems. This is the main reason doing the blog is so therapeutic. EH: Can you share a story of how your adopted children have brought joy into your life? LP: Oh, there are too many stories to share!!!!!! Watching Marie, who is profoundly deaf, learn to dance by feeling the vibrations of the base on the wood floor. Being at DInora’s college graduation with honors despite numerous psychiatric problems plaguing her through her 4 years there. Seeing Steven’s eyes light up when he is crouching on the ground in the woods trying to catch a snake, and his sheer delight when he catches it! Watching Angel mingle with the elderly at a nursing home, dispensing hugs and complements. Knowing Francis lives a wonderful and full life despite blindness because of the way we have raised him, (especially looking at the picture he sent me while skiing in the Swiss Alps with the caption “See, Mom, no trees!” because he knows I was always petrified he would ski into a tree!) They all spend time volunteering and helping others which proves to them that their disabilities are NOT disabling. Every day of their lives bring joy into my life, even the “bad” days. I am thankful that I have found them and that they have found me, and I am so proud of the many obstacles they have overcome. EH: What aspects to your personality have developed from assisting children in need? LP: My personality has been the same since childhood and living with a brother who is severely multiply disabled. I learned to accept everyone and to believe in the value of all human life. I think back to that old Sunday School picture “God Don’t Make Junk”. I have always helped others, even in elementary school. It is the part of my personality that led to the development of our family in the first place. EH: If a genie granted you one wish, what would that be? LP: Oh, of course I would say “World Peace”, but that would sound corny. I think a practical wish would be for people to develop more tolerance towards each other and to learn to love one another despite our differences. Less selfishness and more selflessness. EH: What is the most important way that we can help others, in your opinion? LP: It is important to respect the dignity of others. That means saying hello to the developmentally disabled man in the grocery store. Smiling at the mother who has a baby with deformities and telling her she has a beautiful child, (because, honestly, to HER, that child is beautiful!) Helping the person next to you who is deaf who is trying to get his point across at the store service counter, (grab a paper and pencil.) If people have time, I strongly encourage volunteering. It can be as simple as visiting a nursing home to play cards with a resident, serving a meal at a homeless shelter, or gathering clothes for those in need. If everyone in the world just did one little thing to help others, there would be a huge ripple effect that would improve the world. The constant battles and destruction between the war-torn countries of Israel and Palestine seems to be a myriad of calamity with no resolution. Deaths, bombings and continual fighting between cultures have created a land full of disaster and sadness. But there are two American women that are making a change for the better. Let me introduce you to Hannah Mermelstein and Dunyah Alwan…the creators, and current, as well as past, directors of Birthright Unplugged (Hannah left the organization to pursue additional aspirations in 2009). 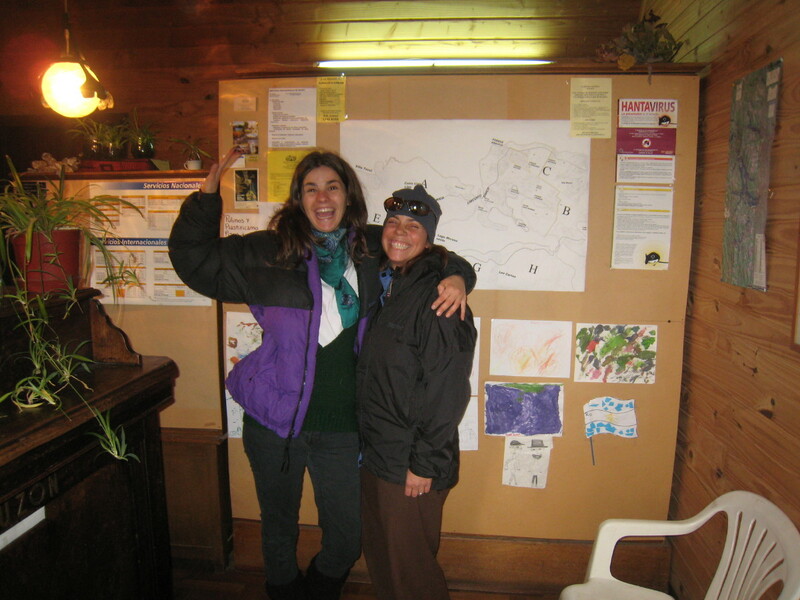 These two Jewish women worked together to creat an agency that is a tool for peace in an, otherwise, dangerous area. 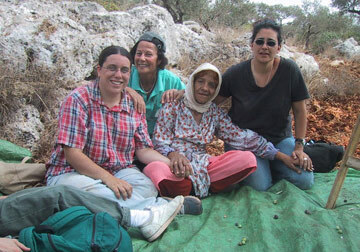 Hannah (left) and Dunya (right) take a break from harvesting olives with an Israeli and a Palestinian woman. Fall 2003, from the Birthright Unplugged website. Birthright Unplugged has different programs that develop understanding, friendship and peace through one-on-one contact. The main focus is to bring the youth of Palestine into Israel so that they may see the land of their ancestors and to bring Westerners into Palestine so that they may meet, firsthand, the loving people of this land of refugee camps. I was able to talk with Hannah and Dunyah and learn what their inspirations, aspirations and insight is on the constant battles between the two countries that have been laid to waste by vicious wars. Continue reading to learn more from women working on the front lines of peace. EoC: How was Birthright Unplugged created? D&H: Dunya and I started our West Bank work with a human rights organization called the International Women’s Peace Service (IWPS). Through IWPS we did several delegations for a variety of people – journalists, activist groups, European diplomats, etc. The predominant request we heard from Palestinian friends and colleagues was to share stories of daily life and struggle in our own communities. As people with quite a bit of experience in the West Bank, we decided to begin bringing more people to hear Palestinian voices and then return to share them at home. We were each leading separate delegations in the summer of 2004. Dunya mentioned to Hannah that her aunt was on a Jewish educators’ trip that refused to set foot in Palestinian communities in the West Bank even after Dunya invited them and offered to host them. Hannah was not surprised, and told Dunya about Birthright Israel and other such opportunities for Jewish people to go on Zionist trips to Israel without any regard for Palestinian life and experience. This conversation led to the beginning of Birthright Unplugged. As people with Jewish backgrounds, with a knowledge of and access to Palestinian communities, we felt it important to offer a travel opportunity with a human rights and activist framing for Jewish people and others. At the same time, we conceived of a complimentary program for Palestinian children living in refugee camps, and six months later we implemented that one as well. EoC: Why did you choose the name Birthright Unplugged? D&H: We were trying to unplug, or take the power out of, the concept of a Jewish birthright to a land that Palestinian people are indigenous to and were expelled from. This concept is basic to us and the symbolic value of our programs is just as important as the actual value. We are not able to, nor do we want to, work with hundreds of thousands of people through our programs, but we want as many people as possible to hear about them and to begin to question concepts of birthright. Having a name like “Birthright Unplugged” is the best way to do that. EoC: What are the ages of the Birthright Unplugged participants? D&H: While most participants are in their 20s, we have had participants range in age from 12-70. EoC: How do you find Palestinians that will do home stays? D&H: Hospitality is a core value for Palestinian and Arab communities and there is a plethora of families who are happy to host international people regardless of nationality and religion. For both Unplugged and Re-Plugged (the Palestinian youth program), we work with organizations we know and these organizations set up the homestays for the groups. EoC: Have your clients remained in contact with their Palestinian hosts? D&H: Many of our participants have remained in contact with their hosts. Some have stayed longer in the region and have gone back to visit their hosts or stay with them again. Others keep in touch via e-mail and via gifts sent through us to the families each time we go. EoC: What are the ages of the Palestinian children that go on tour with you? D&H: The children who travel with us on Re-Plugged are generally 10-15 years old. All are under 16, because at age 16, Palestinians in the West Bank and Gaza Strip receive Israeli-issued ID cards, which Israel uses to control their movement. Until that age, Palestinians through a loophole, have somewhat more freedom of movement. We use our privilege as international passport-holders to accompany the children to Jerusalem, the sea, and their ancestral villages. EoC: How did you become in contact with them? D&H: We work in partnership with at least one organization in each refugee camp where we work. Most of the organizations we either know through our other work in Palestine or through friends. The organizations then pick the children to participate. EoC: Are their parents supportive or worried about them going into Israel? D&H: Parents and children have been both excited and worried about their trip with us. We designed the trip based on the desire we had heard from refugee communities about the places they long to visit, so the journey is incredibly moving for all involved. At the same time, parents have concerns about their children being out for two full days and one overnight, about possibly being attacked by Israelis, and about cultural differences they might experience. The local organizations that the kids work with have the trust of the families and the fact that we are working with the organizations usually helps quell any concerns. EoC: What would you say is the biggest difference between the youths of Israel and Palestine? D&H: We do not work with Israeli youth so cannot speak to that issue. We do, however, work with Palestinians children from West Bank refugee camps and Palestinian children from cooperating organizations inside Israel. Even among these communities the children experience cultural differences based on where they grew up and the different systems and laws imposed on each community. The Israeli government works to disconnect Palestinian communities from each other, and part of our Re-Plugged program brings them back together. EoC: Have you seen a change in your clients? If so, how? D&H: Our Re-Plugged participants have consistently moving experiences with us and express themselves through photography exhibits and writing after their trip. I am not sure we can speak about change in them, however, because we do not know them very well before we work with them and we are only in the camp a few times with them after the trip. Our partner organizations in the camp, who have relationships with these children and whose work our program works to strengthen, could answer this question better. Our Unplugged participants have also been deeply moved by their experience, and many have had radical changes in perspective, understanding, politics, and motivation as a result of our trip. We have seen these changes in the six short days of our trip, and we have also watched our alumnae’s work develop and strengthen over time after their experience with us. EoC: In your opinion, what other things need to take place, other than Birthright Unplugged, that will help to create peace between the Palestinians and Israel? D&H: Palestinian voices must be included in any conversations about their future, and in the worldwide (and particularly Western) discourse about Palestine/Israel. More people need to understand the situation in terms of occupation, colonization, and basic denial of human rights, rather than as a conflict with two equal sides. Refugees (a majority of the Palestinian population) must have their historical experiences valued and their rights fulfilled. Birthright Unplugged tries in a small way to contribute to all of these paths towards justice, without which there can be no peace. EoC: How can we become more involved? D&H: There is an indigenous call from Palestinian civil society for the international community to engage in boycott, divestment, and sanctions against Israel until Israel honors Palestinian basic human rights. The movement is growing around the world and some divestment campaigns have already seen success. Joining a local group or starting your own is one way to become involved. People can also read, write, plan actions, give talks, visit Palestine, individually boycott Israel, incorporate Palestine into teaching curricula, and much more. As for people becoming more involved in Birthright Unplugged in particular, we are looking for venues for our Re-Plugged exhibit to travel. We are also always raising money to keep our programs running – our fundraising happens on a very grassroots level and all support is welcome and appreciated. There will only be change in these countries filled with death and destruction through understanding, peace and love. As Martin Luther King once said, “Peace is not merely a distant goal that we seek, but a means by which we arrive at that goal.” Dunyah and Hannah are making steps towards these imperative teaching tools of serenity by doing exactly that. Please visit http://www.birthrightunplugged.com for more information. One of my passions in life is helping disadvantaged children. Included in the reasons my husband, Jamie, and I decided to move to Argentina from the United States nearly 5 years ago was to assist lower income families access the tools needed to improve their life. 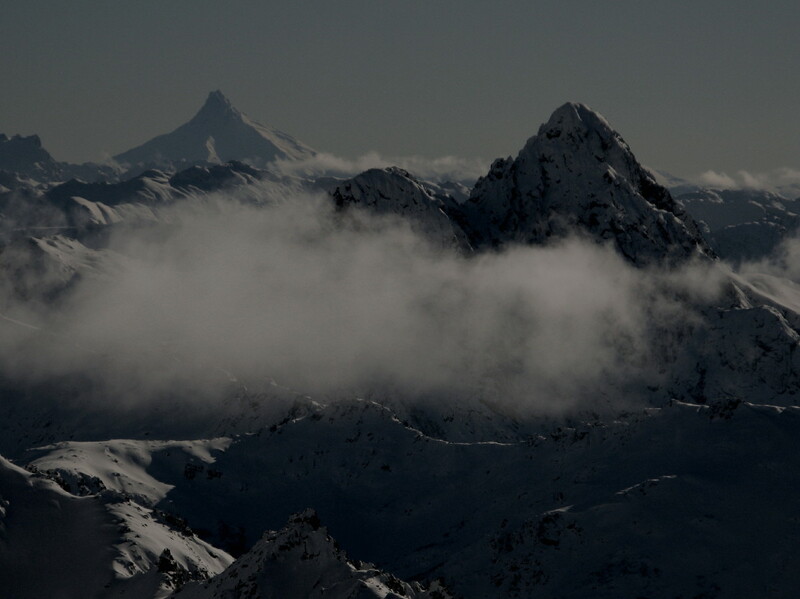 Living in Bariloche we realized that an immense part of the local population does not have the proper gear or means to get into the beautiful surrounding Patagonian wilderness. So, to help other’s experience, and, hopefully, identify and appreciate the amazing natural environment, we started collaborating with our Lake Tahoe, California circle of snow-loving family. We began a program that connected the extra gear from our Tahoe tribe to people in Patagonia 7,000 miles away. Bringing these two factions together has been such a wonderful experience. Not only has it helped shelter people from the cold, but all I have to do is think back to a coat recipient’s smile and my heart is warmed. Well, recently our reach has broadened. We have started working with Fundación Cruzada Patágonica, a non-profit organization with thirty years under their belt, two progressive schools that house over 150 children and the educational curriculum needed to offer those youngsters tools for a positive future. Not long ago, we had the pleasure of lunching with the president of the organization, Diego Baudo. A friendly, welcoming persona with a big smile, it is obvious by the enthusiasm in his eyes that he loves his job. During the meeting we mentioned our winter gear drive and that we had a large box of nice equipment waiting for him in our truck. With our offering a partnership was made; we will continue to help bring in warm clothing and the foundation will sell gear that exceeds what is needed by the children and use the money to help with the school. Excellent! Our last sale brought in over 2,000 Argentine Pesos, which has gone to school supplies for the children. The gear that wasn’t sold was given to the kids. More smiles to keep the heart rosy, thanks to global collaboration. The CEO of Cisco, John Chambers, gives a great interview with Harvard Business Publishing on how collaboration offers successful solutions for today’s company. In fact, this IT mega-presence has taken this mentality of global networking into the architectural structure of their business, completely removing the old thought of “command-and-control leadership”. You are currently browsing the The Era of Collaboration blog archives for February, 2010.